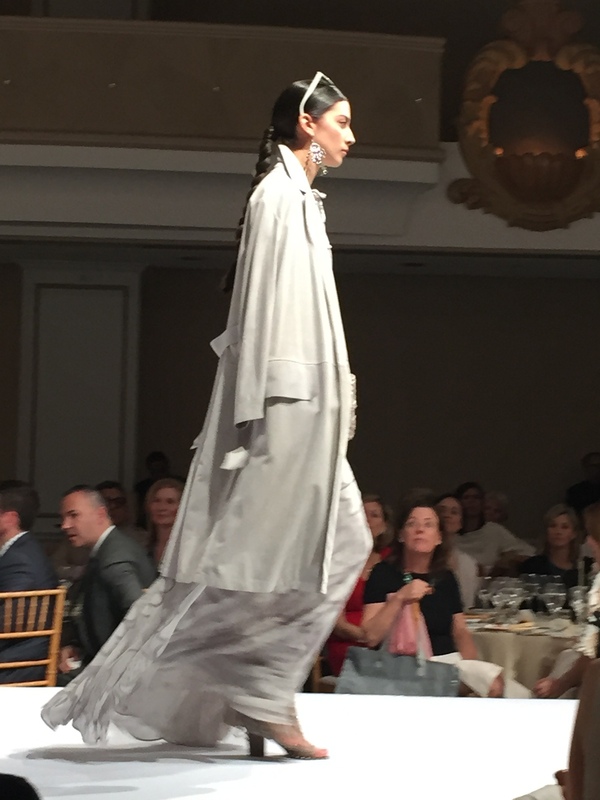 70 degrees, the sun peeking over the hill as I entered the gorgeous Fairmont Hotel in San Francisco, the SF Ballet Auxiliary Show hosted by Neiman Marcus is one of the only runway shows in San Francisco worthy of such a large (450, to be exact), and may I add chic, audience. As I entered the cocktail reception, my eyes could only focus from the neck down. I’m in the business of paying attention from the neck down so please forgive me. Upon first glance, I see a bevy of stylish, sophisticated women double kissing and showering one another with Emily Post appropriate niceties. They are lovely, but I zoom in on a Mary Katrantzou flirty, baby blue structured ballerina dress, which also rather serendipitously made its way into the runway show. A bold and uber chic off the shoulder Faith Connexion tuxedo jacket and metallic pleated skirt, Sophia Webster gladiator heeled sandals and her chartreuse, or was it yellow, Dior clutch on none other than Sonya Molodetskaya. I’d be remiss not to mention the Rubin Singer cream and black printed dress with a structured cape on the gorgeous Sobia Shaikh or the fact that Damion Matthews was as dapper and chicly understated as ever in a black fitted suit and monochromatic shirt and tie combo, his hair styled to perfection. I was so lucky to serve as Damion’s fashion accessory in a few Drew Altizer photos, wearing my own geometric, metallic Kenzo dress and Gianvito Rossi heeled sandals. The quintessential “ladies who lunch” definitely aspired to turn their own fashion quotient up in their freshly pressed Dolce and Gabbana printed dresses and multicolored handbags. Some misses, of course, but I’m not in the business of kissing and telling. Just call me already! A rainbow of pastels paired with moto jackets, dramatic costume jewelry and even a few white pumps (as seen on the marvelous Karen Caldwell) made it into the room. It was as though Ken Downing sent out a memo to step it up or go home. Ave Seltsam took the stage looking like a porcelain doll in her picture perfect white floral print dress and her even more perfect red hair and thanked the crowd for their overwhelming support of the San Francisco Ballet. Mr. Ken Downing then sauntered in, hands in his pockets onto the stage with a sense of petulance and charisma that only he can own. He began by reminiscing about the 60s and 70s and even referenced Stevie Nicks as his style inspiration for Neiman Marcus’s first collection. “Pretty not peculiar,” he told the audience. Fashion words he lives by bestowed upon him by his mother. I’m unsure if the majority of this year’s audience members followed that rule, but they nodded feverishly nonetheless. The first story started and, well, there is nothing quite like a bellowing Stevie Nicks song to get the fashion party started. Fringed bags, jackets and vests ruled the runway paired with long, voluminous peasant skirts, which skimmed the floor so gracefully I swear I had to wipe a tear from my eye. Modern, oversized leather motos in cream, cozy knitted cable sweaters thrown over beaded evening gowns and structured gold embellished Saint Laurent “Sergeant Pepper” inspired jackets hung delicately over the models’ shoulders while they walked with serious intention and equally serious, parted ever-so-carefully down the middle, chignons and slicked back ponytails. An occasional feather headdress donned the heads of some of the models, leaving some of us confused but amused. It’s fair to say, the immaculate white runway hardly stood a chance against the rebellion of Ken Downing’s styling touch. The second story was dedicated to creams and whites and included a Veronica Beard white jacket with a metallic collar and matching white tuxedo pants, long cream trenches over monochromatic printed maxi dresses, and big and burly faux fur vests in cream made their cameo and not surprisingly with Spring so fervently in the air. I was so lucky to have remembered my own white tuxedo jacket. God forbid I not fit in! Lastly, Downing encouraged the amused audience to dance on their chairs ala Studio 54 and just like that, a barrage of glitter, shimmer and rock and roll proceeded down the runway. I’ll admit, the Tom Ford sequin jersey dress that Beyonce wore while on tour in Amsterdam in 2014 is a bit played out and may have encouraged a yawn or two, but the Tom Ford shimmer bell bottoms that bounced their way into my heart did not disappoint. Gold brocade coats over mod floral printed dresses and short shorts paraded down the runway like a scene from Disco Inferno. The show ended with a thoughtful applause and most everyone stood in ovation for Neiman Marcus’ fashion director, Ken Downing. Leaving me in amused bewilderment over those that chose to stay seated (Emily Post would not approve). All audience members were then encouraged to come shop the runway show at Neiman Marcus. Many left, but the tried, the true and those with money to burn, couldn’t get there fast enough. Besides, who can pass up an opportunity to shop and be styled by the man, the legend himself, Ken Downing? All in all, a successful event for the San Francisco Ballet and one I hope to attend again next year.